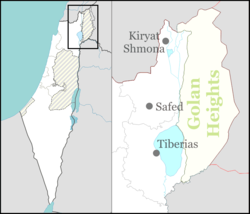 Kerem Ben Zimra (Hebrew: כֶּרֶם בֶּן זִמְרָה) is a moshav in northern Israel. Located near Safed in the Upper Galilee, it falls under the jurisdiction of Merom HaGalil Regional Council. In 2017 it had a population of 481. The moshav was founded in 1949 by immigrants to Israel from Turkey on the site of the depopulated Palestinian village of al-Ras al-Ahmar. Rabbi Meir Yehuda Getz (1924–1995), a kabbalist and the first rabbi of the Western Wall in Jerusalem, was among the founders of the moshav, which was named after Rabbi David Ben Zimra, who was buried with his father Yosef nearby. New immigrants from Romania and Morocco later joined the moshav. The moshav is the home of the Rimon Winery. ^ Khalidi, W. (1992). All That Remains:The Palestinian Villages Occupied and Depopulated by Israel in 1948. Washington D.C.: Institute for Palestine Studies. p. 488. ISBN 0-88728-224-5. ^ Joseph Finklestone (4 November 1995). "OBITUARY: Rabbi Yehuda Meir Getz". The Independent. Retrieved 2010-09-27. ^ Arfa, Orit (5 July 2007). "Wine in the pom of your hand". Jerusalem Post. Retrieved 2 August 2017. ^ "Kerem Ben Zimra Nature Reserve" (in Hebrew). iNature.info. Retrieved 2010-09-27.